V-CUBE and Salesforce Integration “V-CUBE Sales&Support for Salesforce” official release | V-cube, Inc.
V-CUBE, Inc (HQ: Tokyo, CEO&Founder: Naoaki Mashita) and the leader of cloud service, Salesforce.com (HQ: Tokyo, CEO: Uda Eiji), as of Aug. 23rd 2013, combining the strength of Salesforce and V-CUBE Sales&Support, begin offering an integrated service to improve quality of customer support. 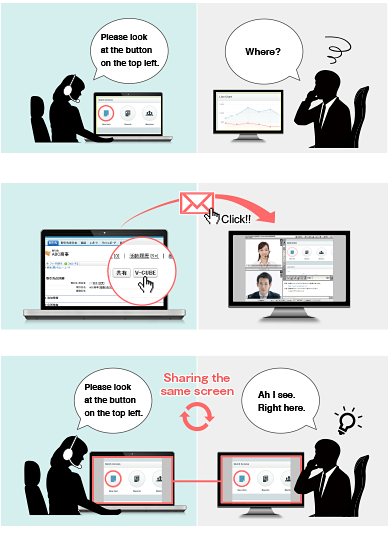 Enterprises can not only communicate with customers over the phone from Salesforce’s interface, but also share documents and PC screen. This makes creating proposal and support customers much easier than ever before. By getting rid of stress created of not being able to see the same information and using document and desktop sharing, enterprise can now conduct sales and support activities even more efficiently. Also, as there is no installation of dedicated application required, this appeals to enterprises because it allows minimum effort from the customer side while helping enterprises to maximize productivity of sales and support activities. In most enterprises’ case, using only telephone for customer support can make conveying information difficult, especially in case of visiting customers without the appropriate information. Also, in terms of support system, the use of service instruction or admin screen, describing the issue orally, going through hundreds of pages of manual can be very timing consuming. “If it is possible to sharing documents and PC screens, and grasp the issue at a glance” is a very common complaint among enterprises regarding customer support. However, with “V-CUBE Sales&Support for Salesforce”, support staff can now share documents and PC screens during customer support. Customers bear no stress as they are not required to install any software, they can receive multi-media support with just a PC and Internet connection. Communicating while sharing documents and desktop drastically increased efficiency of sales activities and shortened the time required to share information, accomplishing true remote support. Regarding the release of “V-CUBE Sales&Support for Salesforce”, we are happy to have received the following comments. V-CUBE will continue to perfect its service from years of experience support visual communication customers to provide the best cloud service.